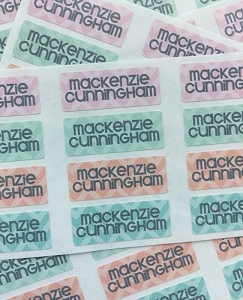 Stick these TINY labels on pacifiers, sippy cups, lids, bottles, bottle lids, lunchboxes, snack cups, plasticware, books, movies, school supplies, cell phones, pool floats, swim goggles, hand-held games, office supplies, flip-flops, laptops...anything that leaves the house! Perfect for daycare, mother's day out, preschool, grade school, church, summer camp, baby showers and birthday gifts. Label with style™! These labels are very nice. I ordered the first set in 2010. They are still on her cups and look great while I am using them for our son. THey last a long time and stick very good to differrnt surfaces. I use them now on thier toys as well. This is a very good product. Love these cute labels. Perfect size and haven't washed off or peeled when I sterilize them. Love these tiny labels! They are the perfect size for lunch containers, water bottles, etc... Seem to hold up very well to washing and soaking when needed. 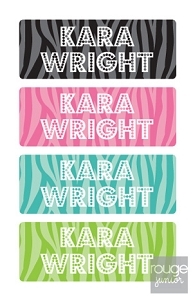 Love these labels! They are great to use on little things that go to daycare with my child like spoons, pacifiers, etc. Very cute print too! 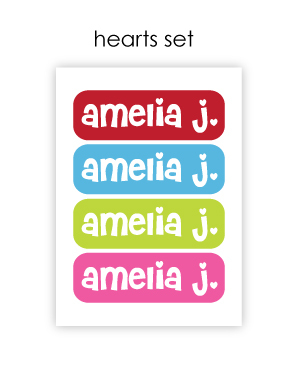 We bought 3 sets of these labels, 2 in the sweetheart colors and 1 in the ocean blues and have put them on baby bottles, lunch boxes, drink bottles and backpacks. The bottles have been only hand washed, but the labels haven't budged or faded at all. I am very pleased with them and would buy them again although I didn't pay close enough attention to the lettering on the sweetheart labels and was suprised when the name and last initial all came in lower case. I bought two sets of these for my kids' daycare stuff. I was worried that they would come off in the dishwasher, but they didn't and have stayed on fabulously! I absolutely love them! Cute colors, cute font, great size for anything. And they got here quickly. I'll be ordering more for Christmas gifts for my niece. These are cute, and so far waterproof! They fit perfectly on binkys (we have the Nuk kind) and fit on small cups, containers, dvds, etc. I would definitely order from this co. again. How cute are these!? I am SO excited to use them! Our little girl is due on June 2nd, and she's the end of the line of 4 people in my life with babies in the past few months, so there are SURE to be mix-ups on who's pacifier is who's! Not Jules'! Hers will be CLEARLY labeled!! Thanks SO much!! These are great! And are the perfect size for pacifiers & bottles.